The number one consideration for all stunts is safety. Second is realism. But to achieve these two factors it takes a lot of experience, calculations and rehearsal. The stunt coordinator acts as the casting director for stunt performers and stunt doubles. They are also responsible for overseeing the stunt performance, which is carefully designed and coordinated with the director. The last stunt team I hired was for a western. The show had a typical corral shoot out with falls, squibs and horse stunts. The team rehearsed in tumbling apparel for hours and then donned their western gear over top the layers of pads they wore. Every fall was perfectly choreographed so the stunt person falling off the roof had more fun than any sense of danger. Everything was captured in one take. A specialist that verified and counted every blank bullet load handled the guns. He was a licensed expert and made sure each bullet was properly packed. Each actor had to check out their pistols and rifles, being given a quick reminder of the proper way to handle firearms. The entire process was down to a science to avoid injury. The insurance on the show jumped up significantly. I was surprised at how much the day cost. I hired a stunt coordinator, five stuntmen and the team’s production assistants. The professionalism of the team and their vast experience made for a wonderful day and great cinematic results. The cinematographer was able to understand the needed placement of cameras to cover every punch and gunshot thanks to the elaborate rehearsal. By positioning the cameras accordingly, the stuntmen could pull their punches, as film is 2D or flat and depth perception is non-existent. The predetermined camera positions added to the realism of the punches. My role was to make sure the stunt coordinator understood my vision for the action and the look and level of danger I needed to appear on the screen. The stunt coordinator then determined the best way to choreograph the stunts to make sure everyone was safe. The first stunt team I ever hired was back in the days when I produced and directed shows for the Wisconsin Television Network. We made an undercover cop show that was filled with chase scenes and gunshots. Detectives would jump over cars, fire escapes, rooftops and other fast moving or nerve rackingly high obstacles. However, due to the safety factor and film being flat, we were able to fake much of the stunts optically. So when it looked like a man ran across a roof and leaped off onto a nearby fire escape, it was actually faked. The rooftop was at ground level. The leap across the alley and into a fire escape wasn’t a 45-foot high location, but rather a 10-foot location with three stories of building optically matted in below it. This was before CGI and moving digital elements. The stunt coordinator works with the department heads to determine what can be done physically versus digitally. 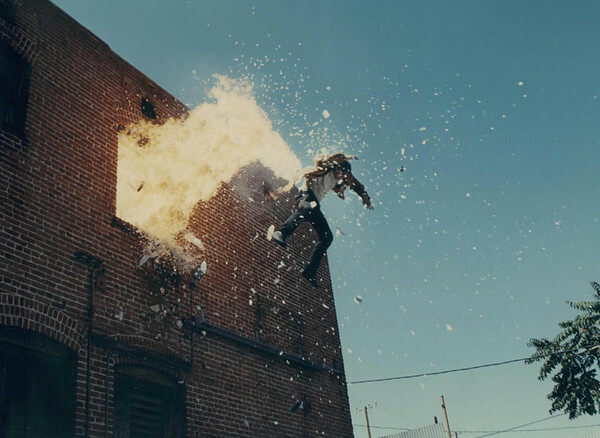 The more physical stunts the more realistic the image appears in the final film. The stunt coordinator works with makeup to ensure the stunt person looks like the character. The production designer, art director and the set dresser help disguise the safety equipment. And, the director of photography or cinematographer helps position the camera for the most realistic look. Many of the top stunt performers belong to the International Stunt Association, which is made up of stunt coordinators, stunt performers and 2nd unit directors that specialize in stunts. However, the stunt performers are contracted under the SAG-AFTRA agreement. Reblogged this on Joey Corpora.